As published on the Barrie Examiner website, November 26, 2011. The 2011 Gifts That Give Fair will be held this weekend at St. Mary's Church Hall at 65 Amelia St. in Barrie. Representatives from numerous not-for-profit organizations will be there to discuss their work and visitors can purchase gifts from tables featuring fair trade items, arts and crafts, bedkits, cards, clothing, gift certificates, goats, chicks and more. Visitors can help celebrate the 65th anniversary of Ten Thousand Villages with Hospice Simcoe, and learn about Grandmothers to Grandmothers, Kids for Turtles, Sleeping Children Around the World, Elizabeth Fry Society, Barrie Fair Trade Working Group, DreamyZ, Canadian Food for Children, Chalice, Birthright, Candlelighters Simcoe Parents of Children with Cancer, Bridget Gallagher's Fair Trade Co., One Tribe Wasafiri and Simcoe Sojourners Friends of L'Arche. The fair runs today from 10 a.m. to 3 p.m., and Sunday from 9 a.m. to 1:30 p.m. The Rotary Christmas Choral Concert will again be returning to the Shaw Festival. This year’s event will feature 10 area choirs who will fill the Festival Theatre with the sounds and spirit of Christmas. The inter-denominational event features choirs from Bethany Mennonite Church (including the Niagara Bethany Handbell Choir), Evergreen Singers, Grace United Church, Niagara Star Singers, Niagara United Mennonite Church, Queenston Ladies Choir, St. Andrew’s Presbyterian Church, St. Mark’s Anglican Church, St. Vincent de Paul Church, and the Young Singers of Niagara. The 11th annual Christmas Choral Concert will take place on Dec. 11 at 7 p.m. at the Shaw Festival. All proceeds from the event will benefit the community programs at Rotary House in Niagara Falls, Youth Unlimited in St. Catharines, Adrie’s House of Hope in South Africa and Sleeping Children Around the World — providing bed kits for children in underdeveloped countries. Tickets for the fundraiser are $20 for adults and $10 for students and can be purchased in person at Simpson’s Pharmasave and Simpson’s Apothecary in Niagara-on-the-Lake, as well as at the Shaw Festival Box Office and participating area churches. Tickets can also be purchased from any Niagara-on-the-Lake Rotarian. For more information, visit www.rotary-niagara.com. Tickets will not be available for purchase on the night of the concert so it’s important to purchase in advance. 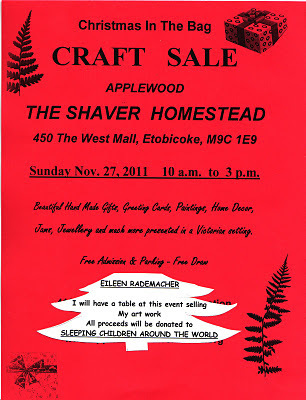 As posted on the Oakville Place Event Guide, November 24, 2011. Get your list ready and put on your brightest smile! Your memorable experience with Santa will be captured digitally by video and photo which you can download, print and send to friends – all free of charge! You’re invited to bring your own camera as well. Photos with Santa on CHRISTMAS EVE will be available by reservation only. Visit Guest Services to reserve your time slot. Donations are encouraged with 100% of the proceeds benefiting Sleeping Children Around the World. Sleeping Children Around the World (SCAW) donations provide bedkits to children of any race and/or religion who will benefit the most; typically being located in underdeveloped and developing countries.No portion of a bedkit donation is spent on administration - 100% reaches a needy child. Each $35 donation (Canadian Funds) provides a bedkit that consists of a mat or mattress, pillow, sheet, blanket,mosquito net, clothing outfits, towel and school supplies. For more information about SCAW, visit www.scaw.org. As published on the Goderich Signal Star website, November 22, 2011. Our town has experienced the devastation of a natural disaster and is slowly recovering and rebuilding. In many parts of the world, famine, drought, poverty and disease are a constant reality of daily life. North Street United Church in Goderich is hosting its fifth annual "Global Giving Mall" to raise funds and awareness for many worthy global relief projects. The Mall is an opportunity to purchase Fair Trade foods, gifts and crafts which support ongoing local and international aid projects. 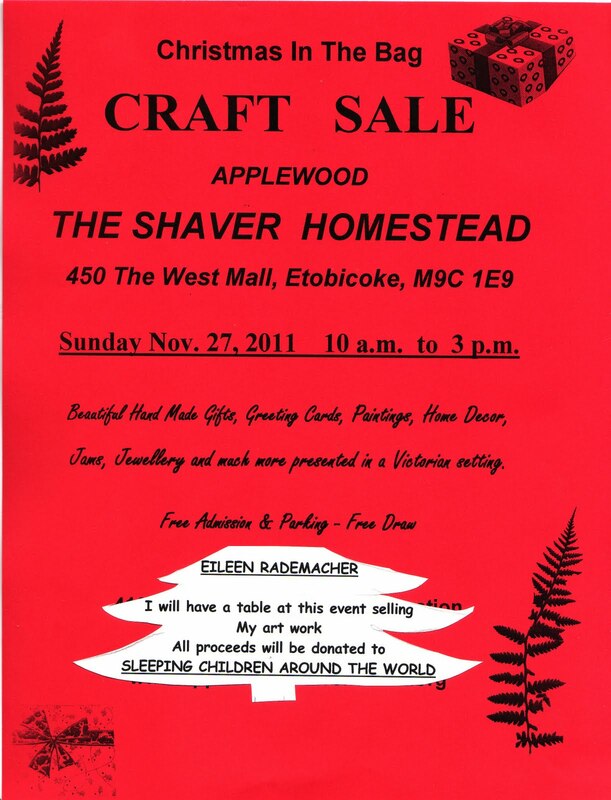 The event takes place Saturday, November 26 from 10 a.m. to 3 p.m. and Sunday, November 27 from noon to 3 p.m. Displays from Ten Thousand Villages, Canadian Foodgrains Bank, Sleeping Children Around the World, Friends of The Orphans Canada, Fair Trade Coffee and Tea and many other charitable groups will be available throughout the weekend. A " Caribbean-style Lunch " will be served on Saturday for a $5 donation to assist with African relief projects. Donations to the Goderich Disaster Relief Committee will be gratefully accepted. You are invited to " Exercise your heart and give a gift to the world". We look forward to seeing you again this year. Photos are available in the Bangladesh 2011 Photo Album. You can view them by clicking the link above. A sincere thank you to all of you who took time out to visit me on Sunday. The proceeds from the sale of my work ($455.00), will be used to purchase 13 bedkits. I am requesting that they be given to the children in Togo. Wishing you all a very happy Christmas and all the best in 2012. As published on the Barrie Examiner website, November 18, 2011. The 2011 Gifts That Give Fair will be held next weekend at St. Mary's Church Hall at 65 Amelia St. in Barrie. Representatives from numerous not-for-profit organizations will be there to discuss their work and visitors can purchase gifts from tables featuring fair trade items, arts and crafts, bedkits, cards, clothing, gift certificates, goats, chicks and more. The fair runs Saturday, Nov. 26 from 10 a.m. to 3 p.m., and Sunday, Nov. 27 from 9 a.m. to 1:30 p.m.
For info, contact Becky Johnson at 705-325-4614, or send e-mail to beckerooski@sympatico.ca. As posted on the Belleville Intelligencer website, November 17, 2011. T'is the season, I guess. The television ads have begun, the malls and stores are gearing up for Christmas and the annual assault on all of us to buy — or give — has begun. On the giving front, there's no shortage of options. You can go big — the flat screen TIV, the latest electronic gee-gaw, gift cards, diamonds (not, I should add, on a newspaperman's pittance) — or you can go from the heart. There's a recent trend to give the gift in someone's name that can benefit the less fortunate in desperately poor corners of the globe. One year, I bought my darlin' daughters goats on a farm in Kenya. At least I think the cheque I wrote eventually morphed into a cute l`il white goat hugged by some impoverished little African fellow like in the television ads. As a guy who, over the course of my admittedly small-town journalism career, has been fortunate to hitch a ride on Hercs, Boeings and assorted other Canadian Forces aircraft, I can tell you there are some hellish places where kids are being raised in all pockets of the planet. In one way or another, I've been brought to near tears or actually shed them in vacation hotspots such as Somalia, slums in Nairobi, Haiti — anywhere in Haiti — post-hurricane Honduras, a battered and tattered orphanage in Ciudad Obregon in Mexico's Sonora Desert and others. It's far, far worse, kind reader, than the stuff you see from the bus shuttling you from the airport to your all-inclusive, believe me. For that reason, one charity I can highly recommend is one I discovered some years ago when, as a reporter, I covered a speaking engagement by Murray Dryden, father of NHL puckstoppers Ken and Dave. I've covered some inspiring speakers in my day, but the quiet, sincere Dryden convinced me his charity was the real deal and why I think anyone searching for some way to do a good deed in this season of excess could do no worse than to send some money for a "bed kit" to Sleeping Children Around the World. Dryden, who started the charity in 1970 with his wife, Margaret, has since died, but the charity lives on and it's the kind I like — it's 100 per cent Canadian and it has another 100 per cent boast. 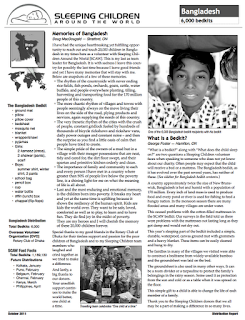 No portion of a bedkit donation is spent on administration — 100 per cent reaches a needy child, the charity proudly proclaims. Each $35 donation provides a bedkit that consists of a mat or mattress, pillow, sheet, blanket, mosquito net (if applicable), clothes outfit, towel and school supplies. It's based on the premise that a child's life may be hellish and poor, but nothing can give him or her a better place to be at the end of a long day than a clean, warm, safe bed. Since its founding by Murray and Margaret Dryden in 1970, SCAW has raised more than $23 million to provide bedkits for children in 33 countries. In 2009 the charity reached its millionth child. One of Dryden's favourite quotes was: "There is nothing more peaceful than a sleeping child." Take it from a guy who's seen enough kids in enough hell holes in the "vacation hotspots" of the world, this charity is one that can make an instant and tangible difference in a child's life. New Life Community Christian Church will be holding a bake sale on Saturday November 26, from 9 a.m. to 1 p.m., at the Thornton Lions Hall. By supporting the bake sale, residents will help contribute to New Life’s support locally of area food banks, Youth Haven and Christmas Cheer, and global initiatives through Compassion Canada, Samantha’s Purse and Sleeping Children Around the World. The 41st annual Thornton Community Turkey and Ham Shoot starts at 10 a.m. on Saturday December 3. The event will be held at 6831 County Road 27, one kilometre south of Thornton, and is open to 12-gauge shotguns only. Turkey, ham and bacon can be won. Also, pie slices are being sold around the village, for chances to win a turkey or ham. For more information, call Mike at 705- 458-9279. The Angus Santa Claus Parade will be held on Saturday November 19, starting at 10 a.m. The parade will run from Peacekeeper’s Park and head across Mill Street to the Essa Recreation Centre and Arena. Once there, children can visit with Santa and enjoy some refreshments. It's always a great little parade, full of community spirit. St. John Anglican Church in Cookstown is hosting the Bon Accord, the Constable family of musicians, for a concert on Saturday November 19. A silent auction will be held along with the concert, to raise funds for the restoration of the church’s 130-year-old bell tower. Bidding will begin at 7 p.m., the concert will start at 7:30, and the evening ends at about 9:30. Light refreshments will be served. Tickets are available at the door, or by calling Jean Reynolds at 705-458- 9222. If you have any news, announcements or coming events, e-mail me at thorntonnews@rogers.com, or call 705-458-0869. Bye for now. As reported in the Huron Expositor, November 14, 2011. Returned recently from the island of Sri Lanka off the southeast coast of India, Gail and Chris Hill, of Seaforth, are still reeling from the stark difference between the "haves" in Canada and the "have-nots" in Sri Lanka. 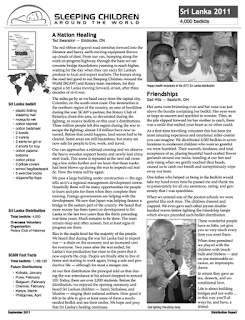 Working as volunteers with Sleeping Children Around the World, the Hills distributed 4,000 bed kits to seven schools in northern Sri Lanka during a two week visit at the end of September and beginning of October. "We're just getting over the after effects of the trip. You come back here and everything seems so shallow. They have nothing there and yet, they're happy," says Chris. While the couple has been contributing to the Sleeping Children organization for years by buying $35 bed kits as Christmas presents for their children and grandchildren, the Hills decided recently that they would like to see the communities that are benefitting from the donations and signed up for the volunteer training. While the organization serves underdeveloped and developing countries around the world, the Hills were offered the chance in April to go to Sri Lanka. Sleeping Children Around the World was founded in 1970 by Murray and Margaret Dryden, who wanted to see every child in the world benefit from the comfort of a good night's sleep. The bed kits provide a mat or mattress, pillow, sheet, blanket, mosquito net, clothes, towel and school supplies and are made in the countries where they are distributed to support the local economy. "It's the only charity that we know of where 100 per cent of your donation goes directly to the children themselves," says Gail. The Hills say the typical school in Sri Lanka is a concrete building with a blackboard painted on the concrete wall. They were greeted at each school with balloons, flowers and a dance presentation by children whose parents had often borrowed an outfit they could wear for the day since their regular clothes are "rags and tatters," says Chris. "The children, when they greet you, bow down and touch your feet to honour you and you feel so humble. We shed lots of tears," says Gail. Most of the children live in two-room houses with dirt floors and everyone sleeps on the floor in one room. Cooking takes place outside "using pots and pans you and I would have thrown out years ago," says Chris. Many of the families live on subsistence farms where they grow the rice they eat during every meal, along with coconuts, pineapple, mango and bananas. While the people speak Tamil or Sinhalese, the children learn some English at school and every visit made by the Hills included a speech of welcome by one of the children. "It was in English and it was flawless," says Gail. "And, even though we didn't have the same language as a lot of people, we managed to communicate. Sometimes we needed two translators." Some of the families walked eight miles to the schools to pick up the bed kits – others had bikes or took "tuck-tucks" which are motor scooter taxis. In a warm climate, which ranges between 20 and 40 degrees Celsius, malaria is common so the mosquito nets can be a preventative tool. The Hills could still see the effects of the 2004 Boxing Day tsunami that devastated the western coast of India and Sri Lanka, killing over 230,000 people with 30-metre high waves. They spent time talking to a fishing family who lived in wooden-framed tents thatched with palm leaves on the beach. The mother, father and four children were squatting in the sand sorting fish, telling them about how relatives had been drowned during the tsunami. They could also see the effects of 30-year civil war and were told repeatedly during their trip by Sri Lanka residents that the country is rebuilding now that the war is over. The Hills were part of Sleeping Children's first trip into Sri Lanka since the war's end. "They want the West to know that the war is over and they're moving ahead now," says Chris. One of the jobs they had was to interview the parents and children to make sure the bed kit donation would be of benefit to them. They learned that while the children had school uniforms supplied to them by the government, they were required to have shoes to go to school but didn't necessarily have access to them. "Flip flops were part of the bed kits but we're looking at providing covered shoes," says Gail. The Hills, who paid for their own trip as volunteers, say they would return to Sri Lanka "in a heartbeat" if they had the opportunity. And, while they tried to prepare with an orientation session, the two say you are never completely prepared for the stark difference between North American plenty and the poverty you see on such a trip. "The poorest schools just erupted with excitement when we walked in. They all said they needed more educational supplies for the children because they realize that education is the key," says Chris. "We see a lot more unhappy 'haves' in this country because they don't have the latest gadgets." "They were just so grateful in Sri Lanka. It was an amazing adventure," adds Gail. The Hills are available to talk to local schools, church groups and other organizations about their trip to Sri Lanka and the charity Sleeping Children Around the World. They can be reached at 519-522-1913. It's that magical time of year again, when jolly old St. Nick makes his way to Sherway Gardens to entertain and interact with his young fans. This 30 minute interactive program includes magic tricks, storytelling, singalongs and more! And at the end of each Santa Experience session there is a special time for every child to visit with Santa while mom or dad snaps a photo. Admission is by ticket only and each session is limited to 40 children to ensure a quality experience. Tickets sell out quickly so we suggest you buy early to avoid disappointment. Tickets are $5 per child (CASH ONLY) and all proceeds go to Sleeping Children Around the World - a local registered charity that provides bedkits (containing everyday essentials) for children in developing countries. (www.SCAW.org). Please plan to arrive 15 minutes prior to your session start time. There are no Sunday sessions and there is no 10AM session on Wednesday, December 21st. 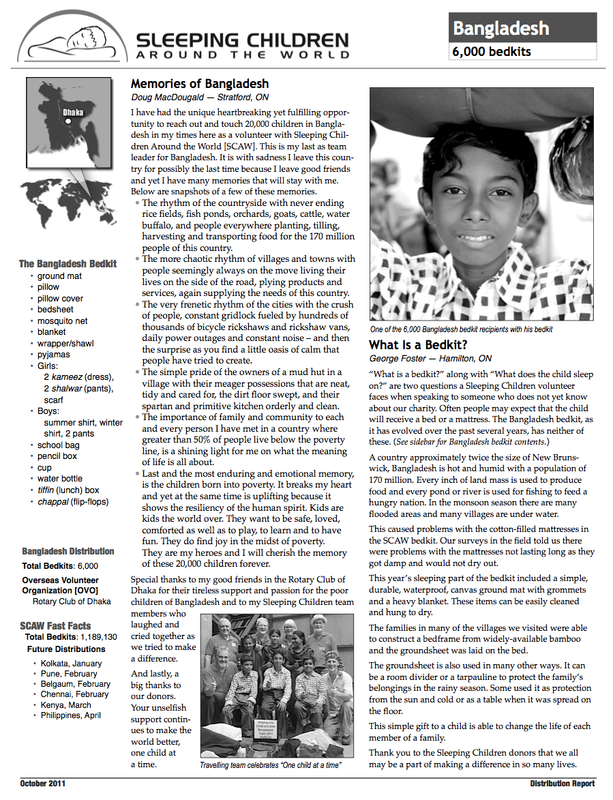 The donor newsletter for the Sri Lanka bedkit distribution has gone to print and can be downloaded from the Sleeping Children Website. Photos are available in the Sri Lanka 2011 Photo Album. You can view them by clicking the link above. On the 3rd December 2011 from 5 to 7 p.m. we will be having our 12 th fund-raising event at St. Paul’s Church at 227 Bloor Street East. As well as some of our regulars. last year we added the international flavour of music and dancing from some of the countries we supply bedkits to and that will be repeated this year. Some of the money raised at last year's concert went towards funding Sleeping Children's 2012 calendar which will be on sale at the concert. Please ask your friends to post this info on Facebook or Twitter. Retired Peel District School Board principal Grant Clark was at Middlebury Public School on Wednesday morning to teach students about a charity close to his heart. 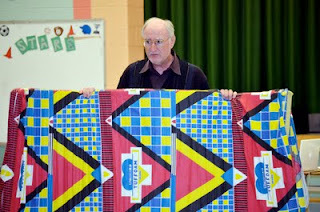 Clark, who worked at a number of Mississauga schools, was invited to speak to the kindergarten to Grade 5 students about Sleeping Children Around the World (SCAW), which donates bedkits to children in underdeveloped and developing countries. Each bedkit contains a mat, pillow, sheet, blanket, clothing, towel, school supplies and mosquito net, if needed. The Erin Mills area school is already involved with the charity, but teachers wanted the students to learn even more about the organization. 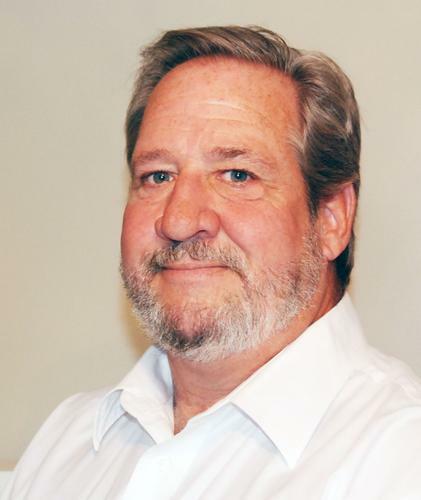 Clark first heard about SCAW in 1983 while he was principal of Sawmill Valley Public School. In the years that followed, his involvement steadily increased until he himself travelled to South Africa to deliver the bedkits. "We aren't just providing a bedkit to these children, we're providing jobs to the locals in each area we visit," said Clark, 65. "Everything in the kit is made within that community." SCAW was founded in 1970 by Murray Dryden, who while on a trip in India tripped over a sleeping child in the streets. He realized that while he may not be able to end world hunger, he could provide a child with a good night's sleep. To date, 1,750,000 bedkits have been delivered. For more information, visit www.scaw.org. Sherway Gardens is selling tickets to its popular children's holiday attraction, the Santa Experience. Admission, at $5 per child, is limited to children aged 10 and under. Tickets aren't required for adults who are accompanying children. The little ones taking part will join Santa Claus for an interactive play session that includes sing-a-longs, dancing and story time. 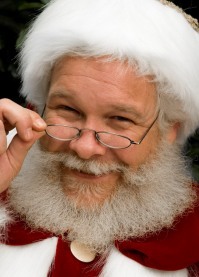 Children will get to share with Santa what they want for Christmas and pose for a photo. The sessions are 30 minutes in length. Dates are Nov. 14-19, Nov. 21-26 and Nov. 28-Dec. 23 (excluding Sundays). Tickets can be purchased at the mall's holiday booth. All proceeds go to Sleeping Children Around the World, a charity that provides bed kits for children in developing countries. Sherway officials are encouraging visitors to the Santa Experience to bring a new, unwrapped toy to donate to The Salvation Army. Each toy donation before Dec. 18 will receive a ballot for a chance to win a special home visit from Santa on Dec. 21. The Kiwanis Club of Picton welcomed its first female president last month – one of three women who have been inducted into the popular service club. 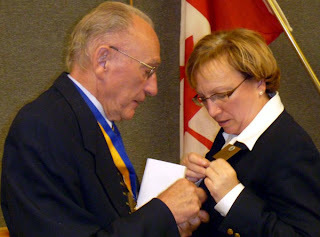 Geri Claxton was installed into office by her father, Randy Claxton, a club past president. 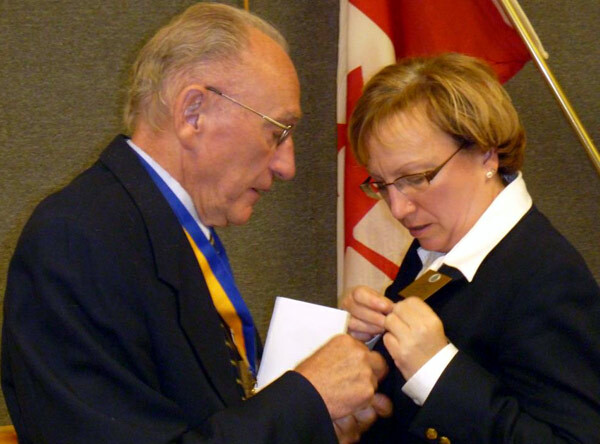 “I was thrilled that the Picton Kiwanis Club even considered me for president,” said Geri, who has been a member since December 2008. She has assisted with Kiwanis events almost as long as her father has been a member. The Kiwanis Club, founded originally in 1927, was the first service club in Picton. The club’s 1927 charter was surrendered in 1943, as a result of the Second World War. However, once the hostilities ceased, the club was re-chartered in 1953. In the early years, the club grew acres of peas and pumpkins as fund-raising projects. Paper recycling was a major fund-raiser for 26 years; and members supported many local concerts and festivals, as well as working at the gates for the Prince Edward County Fair, and helping to set up for local Red Cross Blood Donor Clinics. More recently, the Kiwanis are known for participation in annual events in the county – the May fishing derby; the Pancake Breakfast; the bicycle Colour Cribbage Ride; and working at the gates for the Women’s Institute Craft Show and the TASTE events. Lt. Governor, Frank Wilson, presents Kiwanian John Kileeg with his 45-year Legion of Honour pin. The Kiwanis Club of Picton supports Prince Edward Collegiate Institute’s music programs; minor hockey, soccer, skating and swim programs; Sleeping Children Around the World, Terrific Kids, Girl Guides, Boy Scouts, Children’s Aid Society; hearing and cancer societies, Robin Lake Camp, the Salvation Army Children’s Christmas Party, and the Christmas Kettles program. Club members also deliver Meals on Wheels and many members volunteer with non-profit charities and organizations in the community. In the past, the Kiwanis were involved with bigger projects – the building of Benson Park, fund-raising for the building of the Community Centre, the Salvation Army Citadel, and the Prince Edward County Memorial Hospital; and have also made donations toward the restoration of the Crystal Palace and the grandstand at the Fairgrounds, and the Prince Edward County Hospital Memorial Foundation. The Picton Kiwanis Club meets Mondays at 6:15 PM in the Picton Legion at 347 Main Street.